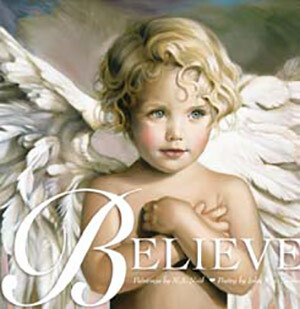 The paintings of N. A. Noel and poetry of John Sisson come together in this book for children and other angelic spirits. Each angel gives voice to gifts of virtue such as Hope, Love, Faith, Compassion and Grace creating a heavenly keepsake collection. Features 10 illustrations and 12 poems. The Believe “regular” edition features white glow-in-the-dark lettering on the front cover. The Believe “gold” edition includes complimentary signature by the artist.